Great salad, and good for your liver too. The combination of these ingredients really awaken your taste buds; trust me you will want to make this recipe over and over. You could change out the apple for pear or peach when they come into season. The pecans can also be changed for walnuts, hazelnuts or even almonds. Have fun making this salad it's a winner. 1. With the kale, as well as shredding the leaves, put a little olive oil on your hands and give the kale a nice rub. This will break down the tough leaves and make them much nicer to eat! 2. Combine the olive oil and mushrooms in a small saucepan over medium heat. Cook, stirring frequently, until mushrooms are golden – remove from pan. Add the apple cider vinegar, maple syrup, salt and pepper to the same pan and whisk well. 3. 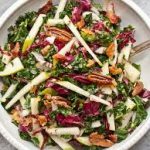 Combine the radicchio (or Romaine), kale, apples and pecans in a large bowl. Toss while adding the dressing, little by little, until the salad is well dressed. •	The fiber-related components in kale do a better job of binding together with bile acids in your digestive tract when they've been steamed. When this binding process takes place, it's easier for bile acids to be excreted, and the result is a lowering of your cholesterol levels. Raw kale still has cholesterol-lowering ability—just not as much. •	Kale's risk-lowering benefits for cancer have recently been extended to at least five different types of cancer. These types include cancer of the bladder, breast, colon, ovary, and prostate. Isothiocyanates (ITCs) made from glucosinolates in kale play a primary role in achieving these risk-lowering benefits. •	Kale is now recognized as providing comprehensive support for the body's detoxification system. New research has shown that the ITCs made from kale's glucosinolates can help regulate detox at a genetic level. •	Researchers can now identify over 45 different flavonoids in kale. With kaempferol and quercetin heading the list, kale's flavonoids combine both antioxidant and anti-inflammatory benefits in way that gives kale a leading dietary role with respect to avoidance of chronic inflammation and oxidative stress.